If you have a collision accident, the front seat may be damaged. In this case we recommend that you have a seat system checked by an authorized Kia dealer. Riding in a vehicle with a front seatback reclined could lead to serious or fatal injury in an accident. If a front seat is reclined during an accident, the occupant’s hips may slide under the lap portion of the seat belt applying great force to the unprotected abdomen. Serious or fatal internal injuries could result. The driver must advise the front passenger to keep the seatback in an upright position whenever the vehicle is in motion. When resetting the seatback to the upright position, make sure it is securely latched by pushing it forward and backwards. 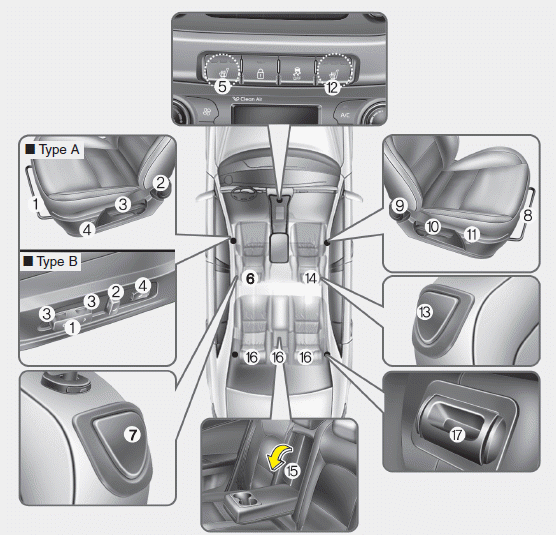 After adjusting the seat, always check that it is securely locked into place by attempting to move the seat forward or backward without using the lock release lever. Sudden or unexpected movement of the driver's seat could cause you to lose control of the vehicle resulting in an accident. Use extreme caution when picking small objects trapped under the seats or between the seat and the center console. Your hands might be cut or injured by the sharp edges of the seat mechanism. Leather is made from the outer skin of an animal, which goes through a special process to be available for use. Since it is a natural substance, each part differs in thickness or density. Wrinkles may appear as a natural result of stretching and shrinking depending on the temperature and humidity. The seat is made of stretchable fabric to improve comfort. The parts contacting the body are curved and the side supporting area is high which provides driving comfort and stability. Wrinkles may appear naturally from usage. It is not a fault of the product. Wrinkles or abrasions which appear naturally from usage are not covered by warranty. Belts with metallic accessories, zippers or keys inside the back pocket may damage the seat fabric. Make sure not to wet the seat. It may change the nature of natural leather. Jeans or clothes which could bleach may contaminate the surface of the seat covering fabric.